I really love making bread. I love the way the dough feels, the aroma when it bakes and of course nothing beats eating it warm from the oven. Making this bread was also a reminder that I need to read recipes properly because I didn't realise until I started that each step took 2 hours. Oops! 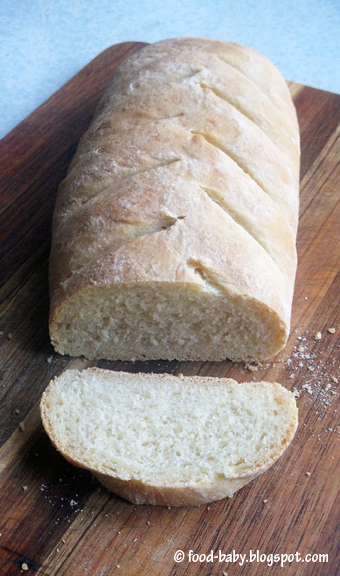 This bread was new to me because it contains semolina which I've never used before. The result was a slightly dense but incredibly flavourful loaf. I didn't love it straight from the oven and thought it was a little too salty. But it was wonderful toasted the next day and I think it would make fabulous garlic bread. I have no idea if I slashed the top the way I was supposed to. Was it just me or were the directions a little confusing? We ate most of the loaf toasted with some slow-cooked baked beans (recipe to come!) and it was the perfect accompaniment to soak up all the sauce. Our hosts this week are Renee of The Way to My Family's Heart and Anna of Keep it Luce. They will post the recipe today so make sure you check it out! Looks fabulous! Yes, the directions for slashing the loaf was confusing. I agree that it was a bit too salty. Otherwise a good loaf. Glad I wasn't the only one who thought so! Yes, the slashing instructions were crazy! But the bread was delicious. I will certainly make it again. I confess, I glossed over the slashing instructions and just did my own thing :-) Didn't find the salt an issue, but maybe its because I used Kosher? Yours looks like a great loaf! Well done! Your loaf turned out very good! With baked beans, I love that idea! Your bread looks wonderful. I couldn't find semolina flour! I didn't get the slashing instructions either! I thought the rolling of the bread was a little crazy, so mine is a round loaf but what a yummy bread! Yeah for bread success! yes, the slashing was a little confusing...your slashes came out better than mine, though. i liked this one, too! Looks beautiful! We skipped this one, as scheduling two recipes together seemed like enough for a summer month. We'll definitely do it in time for the next catch up Tuesday. I didn't get the slashing directions either. I binged semolina bread and decided to do an s-shape. your semolina bread looks lovely!!! The shaping/slashing confusion had me wanting to do it in a loaf pan. Turned out well though! Such a chewy delicious loaf. Definitely a repeat. Would make great garlic bread. And your slashing looks perfect! !